At the end of June 2009, the Cavs acquired a former Lakers center. He was, at one time, widely regarded as one of the best – if not the best – centers in the game. But at the time the Cavs acquired him, those days were long past. When he arrived on the Cavs’ doorstep, there were questions about his durability. Even in a best-case scenario, the Cavs would have to remain extremely vigilant about capping his minutes, conserving the wear and tear on his ravaged joints, carefully milking whatever ability remained in his bones and muscles for maximum effect over the span of 82 games and playoffs. And even if they did all that, he was a near lock to miss games, weeks, and perhaps months, due to the simple fact that his body was already permanently damaged. But the price was right, because on a good night, he could still show flashes of brilliance, still remind you why he won those championship rings in L.A. And even if he couldn’t do it night to night anymore, the prospect of him at his best was still tantalizing enough to take the risk and bring him aboard. And there was that little matter of LeBron James. He could become a free agent the following summer, and the Cavs had to pull out all the stops to try and show him that Cleveland is a place where he could win championships and continue to build his legacy. It was the story of Shaquille O’Neal four years ago. It’s the story of Andrew Bynum now, after he agreed to terms with the Cavs on a two-year, $24 million contract Wednesday evening. $6 million is guaranteed, and the second year is a team option. Shaq’s caveat was based on age. He was 37 at the time the Cavs traded for him. 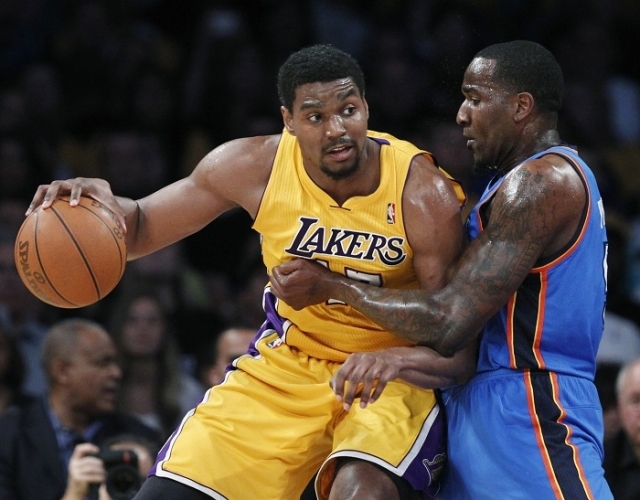 Bynum comes to town at the green age of 25, but with the knees of an 80-year-old. Over the course of his eight-year career, both knees have been operated on multiple times. He has suffered ruptured ligaments, bone bruises, cartilage damage and one would assume significant scarring within both joints. Despite the fact that Bynum was the starting center on two Lakers world championship teams in 2009 and ’10, despite the fact that he had his best statistical season in 2011-12, averaging more than 18 points and 11 rebounds per game, his knees paved his path out of L.A.
With two healthy knees, Bynum is a Laker for life. But last summer, with Bynum’s contract set to expire within the year, the Lakers decided they didn’t want to commit franchise-player money to a player with such damaged knees – a player who has played in barely more than 60 percent of possible regular season games over the course of his career. So after some complicated negotiations, they moved Bynum to Philadelphia as part of a four-team trade that brought Dwight Howard to L.A.
Bynum never played a dribble of basketball for the 76ers. He was diagnosed with bone bruises in both knees before the start of training camp, further injured his left knee during a now-infamous bowling game over the winter, and ultimately had arthroscopic surgery on both knees in March, ending any chance he would have had to suit up for the Sixers. By the time Bynum declared for free agency after the season, the Sixers, and their fans, enthusiastically showed him the door. The Sixers had given up veteran cornerstone Andre Iguodala and promising young center Nikola Vucevic to get Bynum. Bynum gave them nothing in return. Bynum’s attitude often further complicates matters. He has a long history of immature behavior. He swears during live interviews. He’s been known to jack up random three-pointers during games. He’s dished out a few violent fouls that can only be described as punk behavior – most notably in the 2011 playoffs, when the Lakers were on the verge of being swept by the eventual champion Dallas Mavericks. With the Lakers trailing by a few touchdowns late in the game, Bynum blatantly threw his elbow into the rib cage of then-Dallas guard J.J. Barea, as Barea was driving to the basket. Barea crumpled to the ground and Bynum was swiftly ejected, throwing off his jersey as he was escorted to the locker room. None of that is so bad that it’s unforgivable. Bynum committed a far greater infraction when he put off a knee surgery to attend the 2010 World Cup after the Lakers won their most recent championship. Bynum had already played through a torn meniscus in his knee for the duration of the playoffs. The delay in seeking medical treatment after the season (he didn’t have surgery until the tail end of July) caused him to miss the start of the following season. Missing games due to knee injuries is one thing. Missing them due to irresponsibility is another. This is the package that is Andrew Bynum. He’s immensely talented, and he’s accomplished a lot in his career thus far, but between knees that Sixers doctors reportedly referred to as “degenerative” and a history of sideshow-acting, most of the league views him as more trouble than he’s worth. So why did the Cavs want this guy? Are the Cavs that desperate? Seven-foot, 290-pound, 25-year-old centers with an all-star appearance and two NBA titles on their resume don’t hit the open market all that often. Seven-foot, 290-pound, 25-year old former all-stars and NBA champions willing to give the Cleveland Cavaliers the time of day? Virtually unheard of. The only way a talent like Bynum ends up in a town like Cleveland of his own free will is if fate throws a monkey wrench into his career. For the Cavs, Bynum’s knee injuries, his waste of a season in Philly and his threadbare market value comprised a perfect storm of sorts. Bynum needs a chance to resuscitate his career. The Cavs were reportedly the only team willing to give him $6 million guaranteed to give him that chance. What do the Cavs get out of it? The opportunity to just maybe give Kyrie Irving the one thing LeBron never had in seven seasons as a Cav: A legitimate second all-star for a teammate. And if this all works out while the situation in Miami starts to decline, the Cavs can finagle the numbers enough to extend Kyrie, pick up the second-year option on Bynum and still have enough space left to offer LeBron a max deal next summer. That would be the most perfect of perfect storms: A “big three,” right here on the North Coast. For $6 million and no guaranteed salary past this season, Bynum is worth the risk for a Cavs team that has to pull out all the stops in order to try and make the playoffs with room to spare this coming season. If Bynum can once again achieve the heights of his Lakers career, he is arguably the best low-post scorer in the game. He has an extremely rare combination of Brahman-bull strength, upper-body coordination and a feathery shooting touch that allows him to fight through defenders, spin around them and flick the ball over them. It should be noted that Bynum’s career-best 2011-12 season came with Mike Brown at the helm. Bynum and Brown butted heads at the outset of Brown’s short Lakers tenure, but after Bynum bought into Brown’s defense-begets-offense philosophy, Bynum was a force. Brown has brought out the best in Bynum before; the Cavs are counting on him to do it again. But in order for that to happen, Bynum’s knees have to let it happen. The knees that drove him out of L.A. and out of Philly are the knees that made him desperate enough to sign with the one team willing to give him another chance. 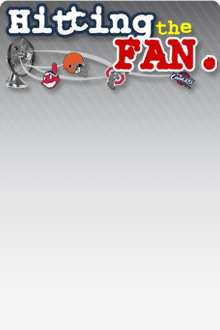 This is the fact of life in Cleveland. Unless they’re drafted, star players come here with warts, or they don’t come here at all. Four years ago, the Cavs tried to squeeze one more year out of an aging Shaq in an effort to win a championship and keep LeBron. It didn’t work out in the end. But give the Cavs credit: They keep trying, they keep looking for creative ways to pad their talent, in a market where the means are limited. Three years to the day after “The Decision,” the Cavs, with a franchise history much longer on heartbreak than triumph, were willing to sign Bynum, warts and all, and dream of a pathway, however uncertain, to better days ahead.